Ansible is a radically simple IT automation engine that automates cloud provisioning, configuration management, application deployment, intra-service orchestration, and many other IT needs. Being designed for multi-tier deployments since day one, Ansible models your IT infrastructure by describing how all of your systems inter-relate, rather than just managing one system at a time. It uses no agents and no additional custom security infrastructure, so it’s easy to deploy – and most importantly, it uses a very simple language (YAML, in the form of Ansible Playbooks) that allow you to describe your automation jobs in a way that approaches plain English. Ansible works by connecting to your nodes and pushing out small programs, called “Ansible Modules” to them. These programs are written to be resource models of the desired state of the system. Ansible then executes these modules (over SSH by default), and removes them when finished. Your library of modules can reside on any machine, and there are no servers, daemons, or databases required. Typically you’ll work with your favorite terminal program, a text editor, and probably a version control system to keep track of changes to your content. ANSIBLE TOWER is the best way to run Ansible in your organisation. 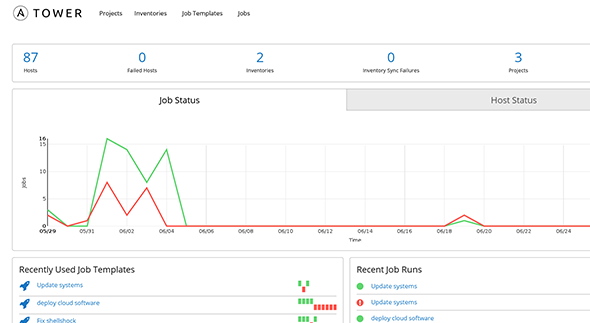 Centralise and control your Ansible infrastructure with a visual dashboard, role-based access control, job scheduling, and graphical inventory management. Tower’s REST API and CLI make it easy to embed Tower into existing tools and processes.